The following comments about attractions in Pittsburgh have been posted from individuals. 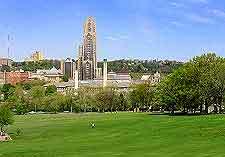 We believe that the best reviews of Pittsburgh, Pennsylvania (PA), PA USA are written by travelers and holiday makers who have experienced Pittsburgh first hand and want to share their thoughts. Can you share yours? Please help us expand this section of our Pittsburgh World Guide. Let us know what you think about the attractions in Pittsburgh, Pennsylvania (PA) USA. Submit comments about Pittsburgh attractions here. Wool! Go Steelers. Glad to hear you enjoyed it, bro. We love our team and the stadium. You might also like the new Consol Energy Center, which is where the Penguins moved to a couple of years ago, or PNC Park where the baseball team, the Pirates, play. Posted on 9/12/2011 by P. T.
I am a fan of American sports and have always visited Heinz Field whenever in the Pittsburgh area. This is one of the most impressive stadiums in the sporting world and has a great museum dedicated to the local Steelers football team and other local outfits that play here. You might even be lucky enough to be in town when there is a huge concert on. It's in the Oakland area of the city and Shenley Park to be exact. I recommend a bite to eat at the natural cafe if you are there around tea time. I was told that the Phipps Conservatory is wonderful any time of the year and confirm that it definitely is during winter, with the glass greenhouse warm even on a snowy day. Wonderful building and flowers to be enjoyed. I liked the Indian Tropical Forest the most of all. Unfortunately I fail to remember the exact location but it is very near Pittsburgh city centre. As our family love architecture and art, I decided to combine the two in one attraction on our itineraries as the Clayon estate of Henry Clay Frick is suitable for lovers of both. This is elegance from the 19th century at is finest while also being fun, cheap to get into, and just five miles from the CBD.